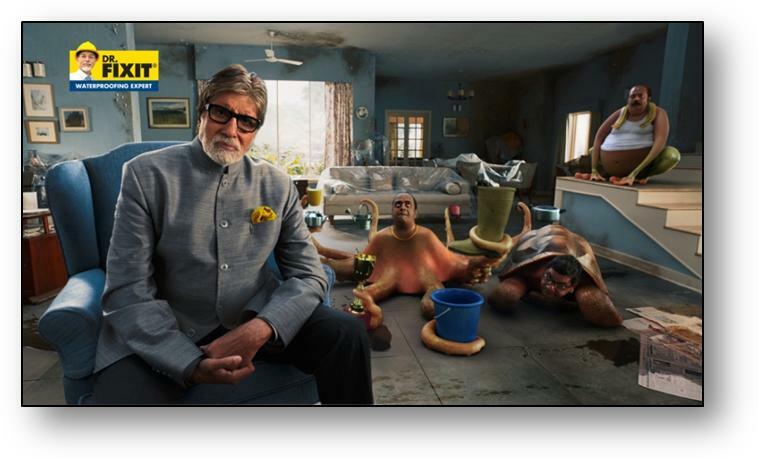 Dr. Fixit, from the house of Pidilite, today unveiled its new TVC campaign featuring legendary actor Amitabh Bachchan, along with an interesting set of aquatic creatures. The TVC urges home owners to avoid taking a shortcut, while constructing their new home and engage in “total waterproofing” with Dr. Fixit, to avoid future cost and damage to their homes. Dr. Fixit commercials are known to educate Indian consumers about waterproofing while constructing their new homes in their usual light-hearted and humorous fashion. The new campaign stays true to this approach, with Mr. Bachchan bringing his own trademark style and wit to it. The latest Dr. Fixit campaign addresses the shortcuts in waterproofing that people usually take while constructing their homes. Most people while constructing a new home, leave waterproofing on others, or don’t pay attention towards it and sometimes even consider it as an unnecessary expense. The TVC underlines the fact that skipping waterproofing can cost even more in the long run, because of the damage that leakage and dampness can cause. The TVC draws attention towards how Dr. Fixit “Total Waterproofing” can safeguard your home and your investment; from unforeseen embarrassment in the future. Most importantly, it urges the consumer to reach out to the Dr. Fixit brand, so that that they can receive the comprehensive “Waterproofing Guide”. This will guide them on waterproofing products and services; in a simple manner. The campaign constitutes of three films featuring Mr Bachchan and an aquatic creature symbolizing embarrassments that customers face when they adopt shortcuts. The TVC shall be aired during IPL season, also on key GEC, news channels and digital platforms.